There are two types of Principles. Best Practice Principles are the type that PEAF provides, which apply to the majority of Enterprises. The other type, are born from your Enterprises Strategy and its resulting Enterprise Transformation Strategy. The purpose of these principles is not to constrain, but to provide a broad cultural framework in which work will be carried out. As work progresses, these principles should be augmented with principles arising from considering the Enterprise Strategy Model. 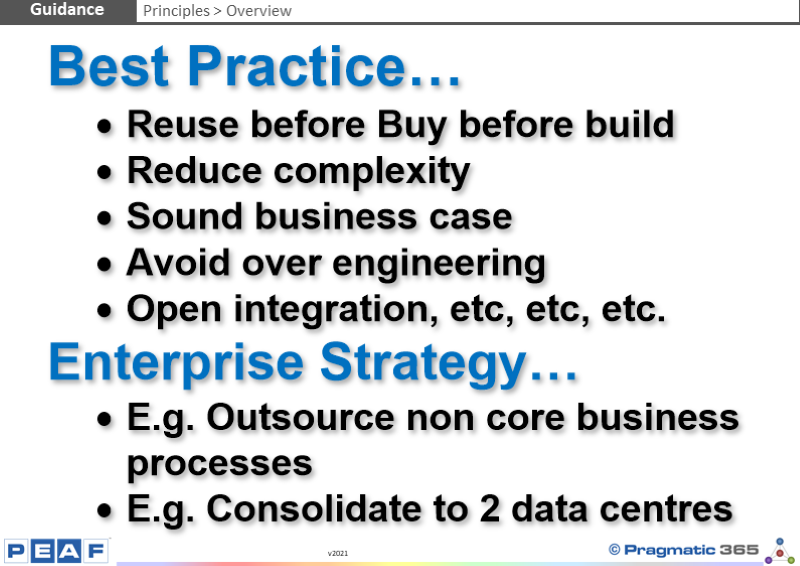 What Best Practice Principles does your Enterprise operate? What Enterprise specific Principles does your Enterprise operate?